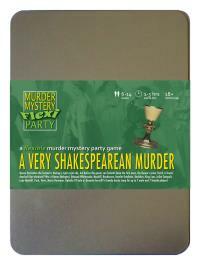 You've been invited to play the role of MACBIFF in A Very Shakespearean Murder. What scream through yonder window breaks? Queen Derivative the Second is having a right royal ado, but before the guests can forketh down the first oxen, the Queen’s jester Yorick is found dead-ed! Join us to find out who-duneth-it! As the King of Scotland, you are clad in a thick red tunic to protect you from the arrows of your enemies. Over this hangs a tartan robe, which you wear proudly along with your hard-won crown. You carry an enormous sword. All hail Macbiff, King of Scotland. Brave, courageous, and pretty good with sharp things. Yorick was my jester, so I was shocked to see him here. It’s treason to leave without being sacked or executed, so unfortunately for Yorick, it’s certain one of those would have come to pass. Alas, the blood is not on my hands - not for this one anyway. With parchment and quill, Lady Macbiff and I retired to bed early and were drawing positions I’d like-eth to fill. Forsooth, seats on the King’s council are available still.